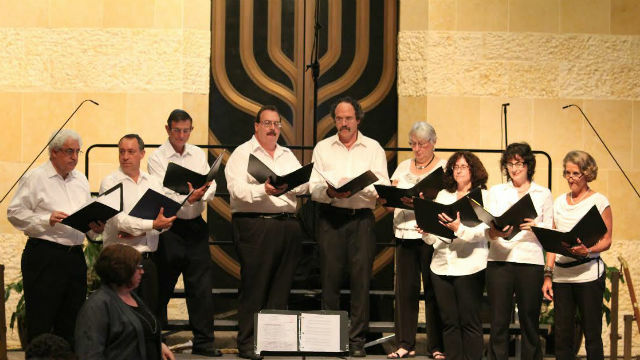 The choir at Congregation Beth Israel. For the 34th year in a row, San Diego’s oldest Jewish and United Methodist congregations will celebrate Thanksgiving together with an interfaith service, this year at Congregation Beth Israel. Rev. Craig Brown, senior pastor of First United Methodist, and Rabbi Michael Berk, senior rabbi of Beth Israel, will jointly lead the Thanksgiving-eve service. The choirs from both congregations will sing celebratory hymns in Hebrew and English. Brown will deliver the Thanksgiving sermon. The public is invited to worship with he two congregations at Beth Israel’s sanctuary in La Jolla. “Thanksgiving is a uniquely American holiday, thanking God for allowing our forefathers to survive and flourish in a new world. But in this national holiday are echoes of the ancient Jewish harvest festival of Sukkot. It is fitting to celebrate this American holiday with an interfaith service, and an honor to do so with our friends at First United Methodist,” said Berk. The location of the interfaith service alternates each year between the two institutions. Last year the service was held at First United Methodist in Mission Valley. The tradition began in 1980. Congregation Beth Israel, founded in 1861, was the first Jewish congregation in San Diego County. First United Methodist Church, founded eight years later, was the first Protestant congregation in San Diego County.